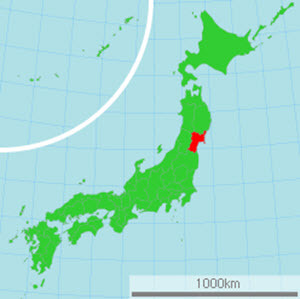 The Miyagi Prefecture is located on the eastern coast of Honshu, in the Tōhoku region. The area around the prefecture’s capital Sendai is rather flat and low-laying, while tall mountains are found in the western part of the prefecture and along the north-eastern coast. The Oshika Peninsula projects into the Pacific Ocean in a south-eastern direction from the northern coast. One of the most well-visited places in the Miyagi Prefecture is Matsushima, a bay dotted with over 250 small pine-clad islands and islets. Matsushima is considered one of the Three Views of Japan, and cruise boats are available for tourists who want to see the islands up close. Tanabata, also known as the Star Festival, is a Japanese festival originating from the Chinese Qixi Festival. The Rikuchū Kaigan National Park (in 2013 the park was incorporated into Sanriku Fukkō National Park). The Sendai Aiport is an international airport located in Natori, roughly 14 km from Sendai. From the airport, you can travel by railway on the Sendai Airport Line to downtown Sendai. The trip takes about 25 minutes.